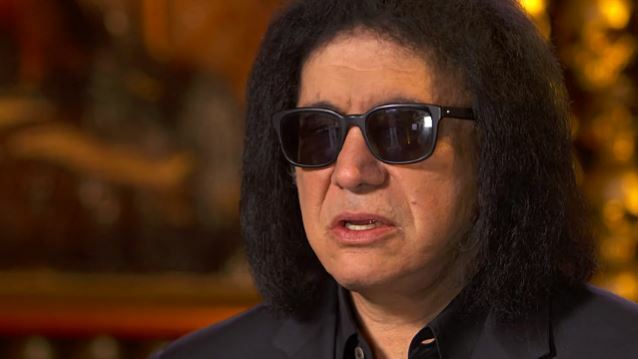 KISS bassist/vocalist Gene Simmons recently sits down with Pfizer chief medical officer Freda Lewis-Hall, M.D. to discuss his heart scare with atrial fibrillation, or AFib, a type of irregular heartbeat. "I had never heard of the term AFib, but about ten years ago, we were on tour some place, and on stage, the temperature goes up about a hundred, with all the stage lights," Gene said (see video below). "And my heart would go, [imitates irregular heart rhythm] — like that. I started to get dizzy and perspire and short of breath. So I called a doctor, and he showed up and said, 'Okay, here's what's going on. There's something called AFib,' and he went down the list. And it was a lot to take in." He added: "Since that event, I haven't really had recurring problems, because I get plenty of rest, drink lots of liquids, but am I prone to AFib? You betcha." According to Pfizer, AFib is the most common form of irregular heartbeat, and it affects more than three million Americans. It can cause the heart to quiver, race, or seemingly skip a beat. This happens because the top chambers of the heart, the atria, don't conduct a normal electrical signal and can struggle to properly pump blood through the heart. So, blood that should move out of these chambers can pool and form clots. This can be dangerous because clots can travel to the brain and cause strokes, or block blood flow and lead to heart failure. AFib can exist without any symptoms, so people can walk around with it and not know it. This is why it's important to see a doctor for regular checkups, because sometimes they're the only ones who can diagnose it. They will listen to your heart, feel your pulse, and may do an electrocardiogram, also known as an EKG. An EKG may sound dramatic, but it's a simple and painless test that involves putting sensors on different parts of your body so doctors can see the rate of your heartbeat, as well as the timing and strength of the electrical signals as they travel through the heart chambers. AFib generally affects older people and those with heart disease, high blood pressure, thyroid problems, kidney disease, or diabetes. Risk factors include high alcohol or caffeine consumption, family history, and obesity.